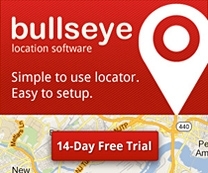 There are many methods for implementing the Bullseye platform into your business including website, mobile and Facebook locators, turn-key or custom solutions as well as integrations with popular systems like Salesforce. It can also be used to create widgets which have a single, valuable purpose. Today, I’m going to share how to implement a simple nearest location widget that can go in the header on your website or mobile site.